First State Plates: Iconic Delaware Restaurants and Recipes is a collection of iconic, mouth-watering recipes from Delaware dining establishments and eateries. Learn how to prepare a Walter’s Steakhouse Bone-In Rib-Eye, assemble your very own Crab Cake like the pros at Abbott’s Grill or gather all the fixings to make the Cioppino from Big Fish Grill! Learn about how Delaware’s best restaurateurs planted the seeds and accomplished their lifelong culinary goals to make their restaurant dreams a reality. 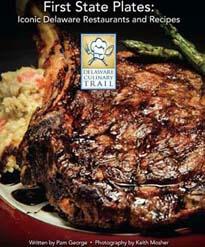 First State Plates: Iconic Delaware Restaurants and Recipes is a must-have cookbook for the Delaware culinary fanatic! Travelers that complete the Delaware Culinary Trail will receive the limited-edition cookbook"First State Plates: Iconic Delaware Restaurants and Recipes." The First State Plates: Iconic Delaware Restaurants and Recipescookbook is also available for purchase online. To place an order for the cookbook, click here. Please note that shipping will take approximately 14 days.